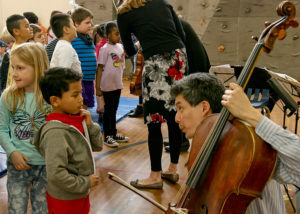 The Music in Schools (MIS) Outreach Program is in its 26th year of providing widely varied musical enrichment to underserved students in Seattle Public schools. 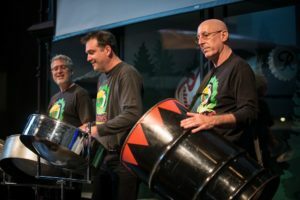 MIS coordinates programming provided by LMC members, other local professional musicians and a long-established partnership with the University of Washington’s Meany Center for the Performing Arts which arranges for school residencies featuring the internationally acclaimed and culturally diverse performers who appear on the Meany stage. • Sanislo Elementary, a part of the South Delridge neighborhood for more than 40 years, is now enrolling second-generation students and prides itself on family involvement, while its open plan architecture fosters a dedication to collective, community based learning. 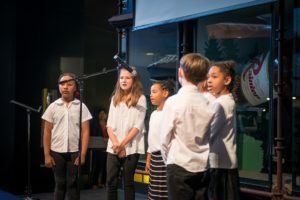 BF Day Choir Members perform at the Museum of History and Industry celebrating LMC’s 125th Anniversary, July 2016. In addition to working with these schools, MIS is an ongoing sponsor of the student chorus at BF Day Elementary School in the Fremont neighborhood, and not only funded the chorus director’s salary and ancillary expenses, but also provided transportation for the students to attend the her pipe organ/music history presentation of the History of Western Music at Plymouth Congregational Church. 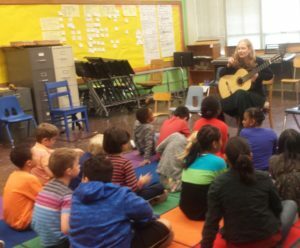 MIS also sponsored 2015 LMC Award Tour artists, Cameron O’Connor, guitar, and Erik Steighner, saxophone, in performance at the Boys and Girls Club associated with BF Day. 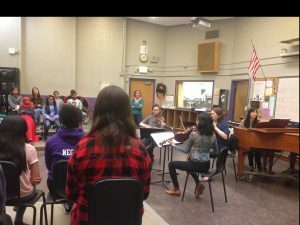 At Washington Middle School, MIS provided liaison for a creative Master Class with Orchestra and Band Ensembles featuring the DeCoda Ensemble with Saeunn Thorsteindottir, of the University of Washington’s School of Music. 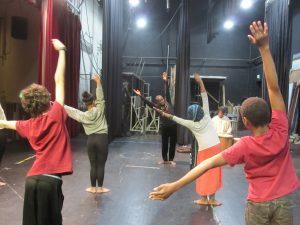 In all, during the past school year, more than 7,000 student contacts were made in five schools, through performances, interactive student participation, the student choir, collaboration with Meany Center, and other programming opportunities.